There is nothing better in the world of commissioned artwork than being awarded a contract to paint strictly out of the imagination...within a certain sensibility of course. After all, the commissioned work must by its very nature be reflective of the ambiance in the space where it is to permanently installed. That is a consideration that will be deeply appreciated by the patron of the project. The sensitive artist will intuit the way from the blank canvas (and blank stares) of the unformed idea to a concept that fascinates and mesmerizes the 'committee' into a willing suspension of disbelief, to dream along with the artist of a 'crowd-sourced' solution. Such was the case, happily, with the steering committee to outfit the Ecumenical Chapel in the new Manitou (Seniors') Lodge attached to the Watrous Union Hospital. Make no mistake about it, once I had heard about this project on the local artists' grapevine, I resolved in my mind that it would be an excellent project to 'get'. The new Lodge in Watrous is only a few minutes drive from here so mileage was not an issue. 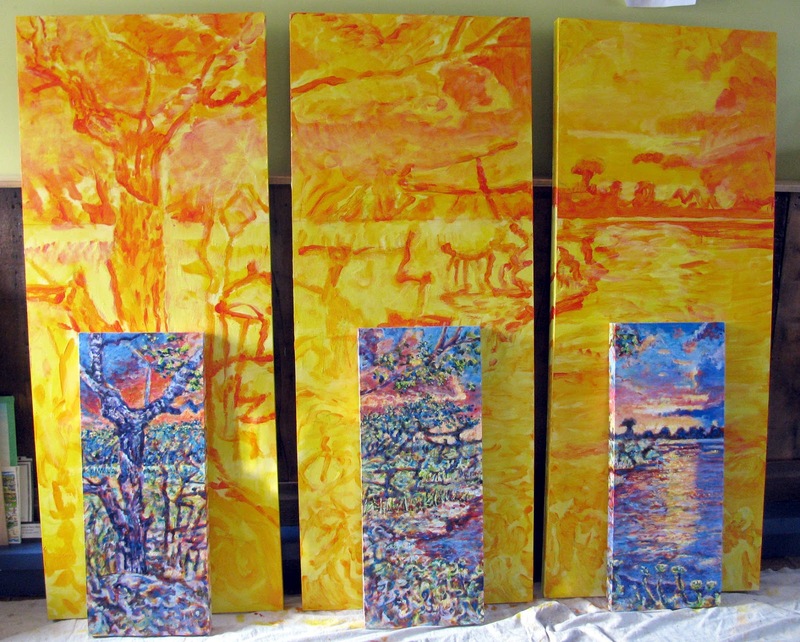 Plus, at our first meeting I suggested the idea of installing three panels to form a triptych. 'Install' being the operative word. I could just paint the thing in my own studio. The initial mock-up that I created for our second meeting was painted on a single stretched canvas. I computer-generated this version that shows the design as a triptych or three separate panels. For some reason I decided to take a chance on romance...and committed myself to 'making up' a landscape with a few things in mind. This spilled out of the ideas that were tossed around at that first meeting. 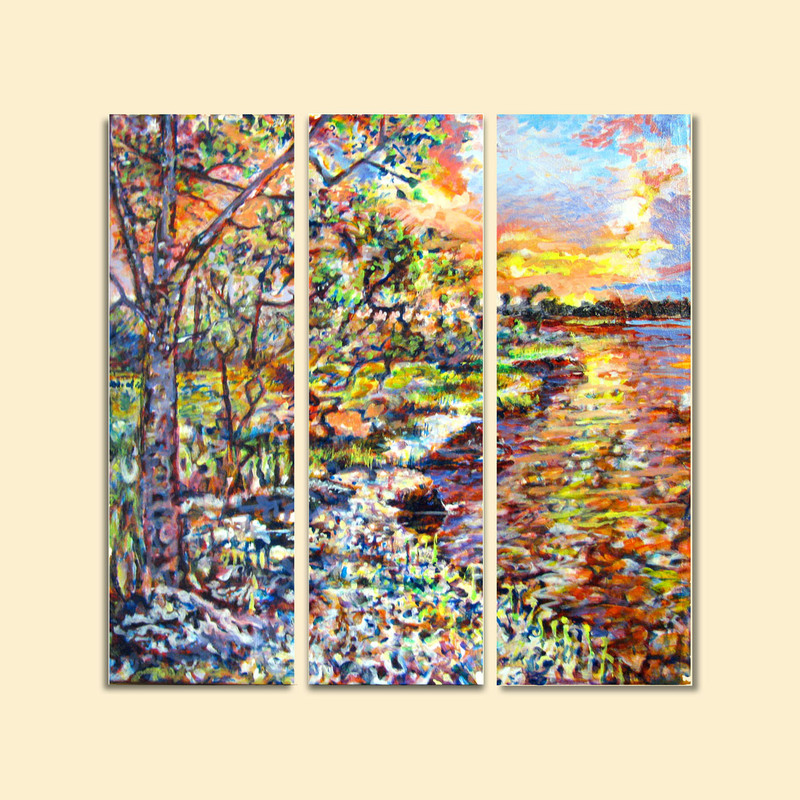 The idea of three panels sets up a natural progression of the eye from left to right, so it made sense to optimize this with a progressive series of images. The eye alights in the shady area of the tree on the left to be lead down a winding shoreline to a splendidly adorned evening sunset. The overall coloring tends to the cool lilac side, which is a restive and soothing hue. In contrast and to warm things up a bit, the sunset colors range across the whole spectrum with an emphasis on the orange-y yellow zone. The overall, casual impression is of a conventional 'landscape' but upon closer inspection the eye sees slight anomalies that reveal a sense of surrealism...things that may or may not be images flicker just outside of our peripheral vision. As a starting block I relied upon my imagination with the condition (which I clearly stated in my formal presentation ) that I then carry on to model a second set of panels from the imaginary first. And then finally a third set based on the intermediate panels for 'three degrees of separation' from the original source of the image. Remember, that would be out of the recesses of my cranium. My reasoning, bold as it may seem for such a 'mainstream' commission, was that the end result be purely imaginative with no guarantees of any semblance of reality. Much to my very pleasant surprise, after a couple of weeks I received a phone call from the Health Care District to inform me that I had been awarded the contract. Not only was I extremely stoked about the freedom I was being granted, I was also impressed that my budget had been improved without so much as a whimper. Now that's what we're talking about! Standing with the preliminary sketch (on the ledge) along with the intermediate panels AKA Phase 2. The full-sized panels can be seen behind. The intermediate panels placed in front of the full-scale panels early in the painting of 'phase 3'. Here are some fairly random details of the painting that show my tendency to stray rather far away from the standard 'rendition' of your typical landscape. Instead, in this case at least, I decided to follow my intuition to wherever it lead me. Remember, the concept of this piece revolves around the contemplative setting of an ecumenical chapel in a Senior's Lodge. While not imposing itself on the viewer, this painting is conceived to offer a sort of visual 'portal' to encourage free thought and only a very subtle atmosphere of a quietly creative psychic respite. Nothing too rambunctious. But also not simply dull and routine. It's a fine, almost precariously perched balance. It would take a careful eye to patch in these details to their correct position in the mural. I think it is very interesting that pretty much everyone who has seen this piece to date has not only liked it, the general consensus is extremely enthusiastic. Which tells me that there is a lot of room in peoples' mental framework for acceptance of quite abstract work, bordering on the 'surreal'. Not only did the steering committee for this project affirm their admiration of the more abstract genre, but it is being embraced by the general public in terms of very positive adjectives like: "warm, inviting, comforting, soothing, calming, inspiring..." This feedback has been the most rewarding part of the project. The panels have now been safely delivered (without a scratch) to the Watrous Union Hospital where they will be kept in secure storage until they are permanently installed in the new Ecumenical Chapel. This is slated to take place sometime in May or June of 2012. 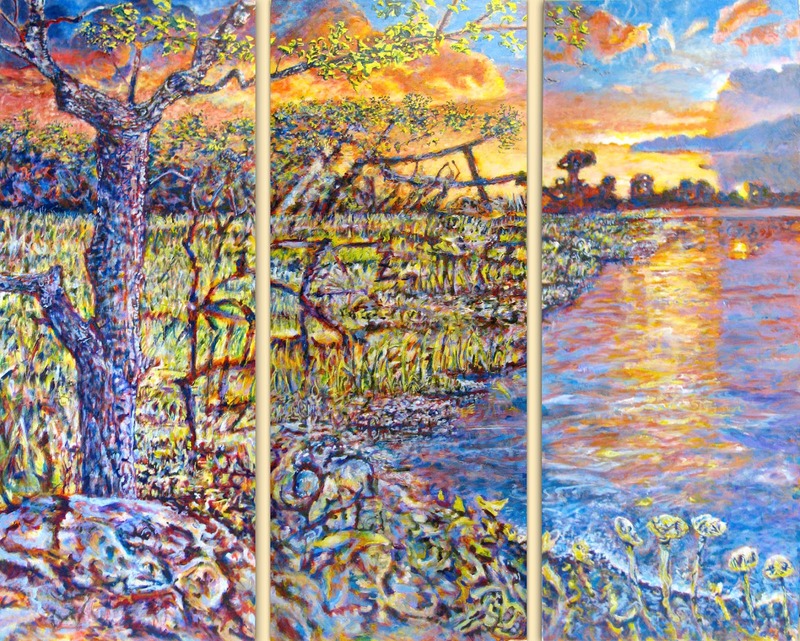 The triptych of panels 'Imaginary Landscape'. So you see, there IS hope for the acceptance of edgier, more challenging art than might first be imagined. I am so happy and gratified that the committee shared my enthusiasm for a more creative approach to this project. 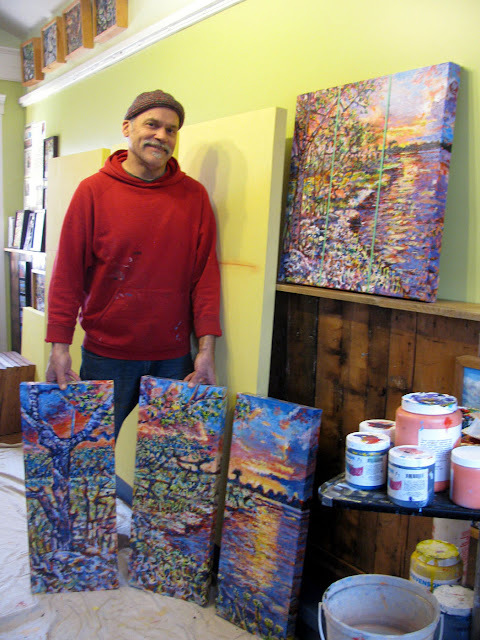 I feel it's a win-win-win situation for all the parties: the committee, the viewing public and myself as an artist who dared to offer an artistic vision that was perhaps a bit unexpected yet as it turns out yields a very positive outcome.